Obverse Image: Charles E. Barber's Liberty Head motif, commonly referred to as the "Barber" style, was used on quarter dollars from 1892 through 1916. The obverse motif of Miss Liberty is similar to that found on the dime and half dollar and features her facing to the right, her hair in a Phrygian cap, wearing a laurel wreath with LIBERTY on a small band above her forehead. Reverse Image: An adaptation of the Great Seal of the United States and depicts a heraldic eagle holding in its talons an olive branch and arrows, although the branch and arrows are transposed from the position used on the quarter nearly a century earlier. $2.7036 is the rounded silver value for the 1892-1916 silver quarter on April 25, 2019. This is usually the value used by coin dealers when selling these coins at melt value. However, the total melt value is continued below. $2.7076880393 is the total melt value for the 1892-1916 silver quarter on April 25, 2019. The "Year" column lists the year and mint mark on the coin -- D is for Denver, S is for San Francisco, O is for New Orleans, and P is for Philadelphia. A coin without a mint mark means it was also minted in Philadelphia. The "Mintage" column is the number of coins struck and released by the U.S. Mint. The "Numismatic Value Range" column represents what people typically pay for that type of coin (usually a very wide price range depending on the condition). Viewing current eBay auctions can give you an up-to-date "market value" of your coin by understanding where auction prices are ending. 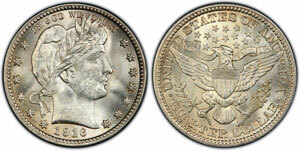 If you're interested in learning more about grading Barber quarters, Photograde is an excellent resource.